The SeQual Eclipse 5 Upgraded Accessory Bag gives you a luxurious and convenient option for toting your SeQual Eclipse 5 accessories around. This upgraded accessory bag Velcros onto your travel cart allowing you keep one hand free while you are navigating your way through the airport. It also zips shut to secure everything you may have inside. The biggest perk of the Eclipse 5 Upgraded Accessory Bag is its large and roomy, compartmentalized interior. 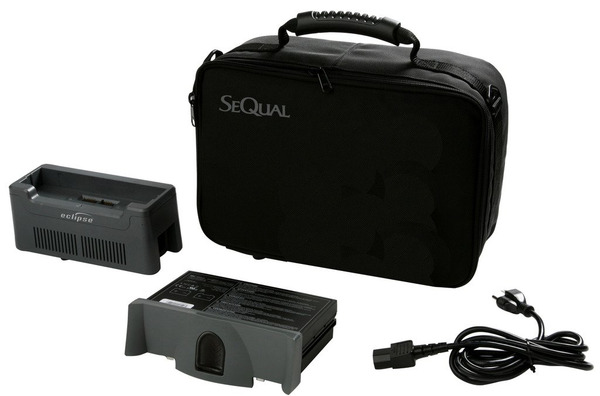 With 4 removable separators, there is more than enough room for your power supplies, external charger, and more! On the top flap there is a transparent zipper pocket which is perfect for any oxygen prescriptions or oxygen related documents.